The year is drawing towards its shortest day here in the northern hemisphere. It seems a natural time to slow down, to enter a sort of hibernation and withdraw, settle into a kind of sleep. But for most people there isn’t a slowing down. Rather there’s a final push of hard work to get the year’s tasks finished and a rushing to prepare for Christmas; it can be hard to maintain this energetic racing around against the magnetic pull of colder days and the long presence of night, but such is the way of life in the west, where seasonal changes are smoothed over by busy calendars of work and activity. We have decided to take a step out of the frantic bustle of the year’s short days and walk. We wanted to experience the contrast between the short days of winter and the long days of summer at the seven trees by walking to them and witnessing dawn and dusk with them for seven days in summer and again for seven days in winter. We will be heading out tomorrow, to walk beneath leafless trees, cross water, rock, grass and bog, and make step after step overland. We had originally planned to walk the entire 130km to link all the seven trees – but that was before we did our seven-day link walk in midsummer. It was tough in midsummer and we changed our minds then: with only seven hours of daylight at this time of year (compared to more than seventeen in midsummer) and the added challenge of cold and wet weather, putting ourselves (and our springer Guillemot!) through that kind of challenge would be far from fun. So we have decided to take a different approach. We will be taking it one tree at a time, starting at the Wasdale Oak, walking to the tree and walking out again, and then driving to Borrowdale, and walking in to the Langstrath Birch, and out again, and so on. So we’ll be heading in a series of walks from west to east, towards the rising sun on the shortest day of the year. Instead of hiding from the darkness and switching lights on, we will take time to be immersed in it. 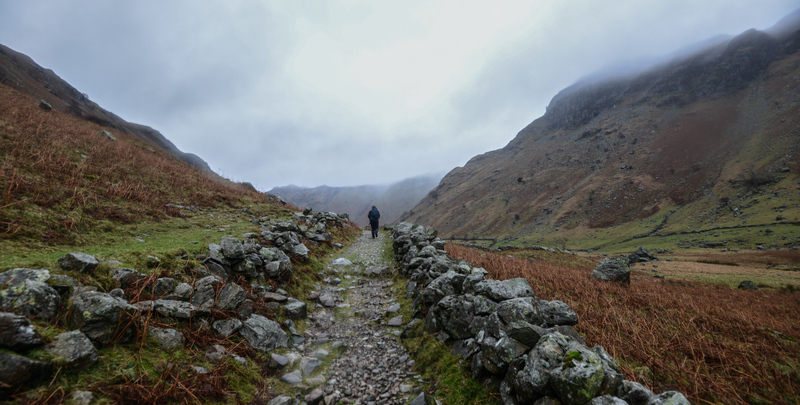 In terms of weather, our predictions are that it will be grey and dull most of the time – and we will be walking in fog tomorrow (gorgeously atmospheric). But we are hoping for some clear starry skies, a minimum of wetting, and as much sunshine as the clouds will allow. There’s no snow forecast, which is a shame but probably for the best in terms of our comfort overnight. As well as being a time to dwell in the darkness, the week will give us a chance to slow down and reflect on our own year with the seven trees, and on what we have learnt, the people we have met and the words and images we have produced. We will also be looking forward to 2017 and the creation of a book and an exhibition and anticipating a lot of pondering and conversations about these. We will also, as ever, be mindful of the bigger picture. 2016 has been a sobering year with quite incredible political events, deeply disturbing wars with levels of loss that are hard to fathom, and ever more concerning predictions about loss of species and habitats and a rapidly changing climate. The physical darkness of midwinter could be taken as a metaphor for many things but we will do as we always try to, and encounter each day with empty, open minds, and see what emerges. We’ll come out the other side for the slow but certain lengthening of the light. We will be able to post from time to time on Facebook and Twitter so will keep in touch that way. Our gear for this walk is not dissimilar to the summer walk – just a bit of extra warmth to keep us going and a few extra pairs of gloves and thermals. And we’ve swapped our lightweight summer boots for winter boots, with thanks to Bramwell International who have supplied us with a new pair of Meindls. We would say we’ll try not to get them muddy but that would be folly: of course we will.